Use the boring handle to select your sample, then just remove it and replace it with a special extractor unit. This special handle neatly and easily removes your soil plug intact. 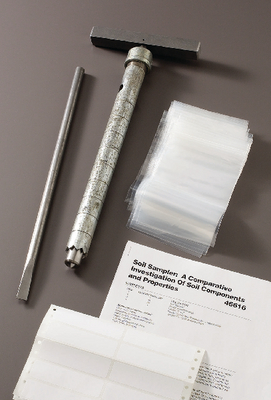 The sampler also features a depth measurement scale, allowing you to collect multiple samples from uniform depths up to 8" with a minimum of fuss. When you are finished in the field, just use the boring handle or a stiff brush to clean it. It comes with enough soil collection bags and labels for 30 students, a teacher’s guide, and a student study guide copymaster.